Students at Los Altos School District schools and Bullis Charter School are participating in the nationwide “Hour of Code” event this week, an effort recruit millions of students across the country to try computer programming for one hour. BCS Communications Director Emily Nelson says this initiative builds on the work already being done at BCS, “computer science has been a part of the fabric of our school since the beginning through our Project Based Learning units, co and extra curricular classes, and core instruction. • Fun in the computer lab. Students will play and experiment with computer science. Tutorials will feature lectures from Mark Zuckerberg and Bill Gates, and artwork from the popular games Angry Birds and Plants vs. Zombies. No experience needed! • When will students participate? After school during the week of December 9-13 in ROOM 401. • Every student should have the opportunity to learn computer science. Basic programming activ­ities help nurture creativity and problem solving skills. By starting early, students will have a foundation for success in any future career path. • Computer programming jobs are growing 3 times faster than students entering the field. Yet fewer schools teach computer science than 10 years ago. 90% of K-12 schools in the United States don’t teach it at all. 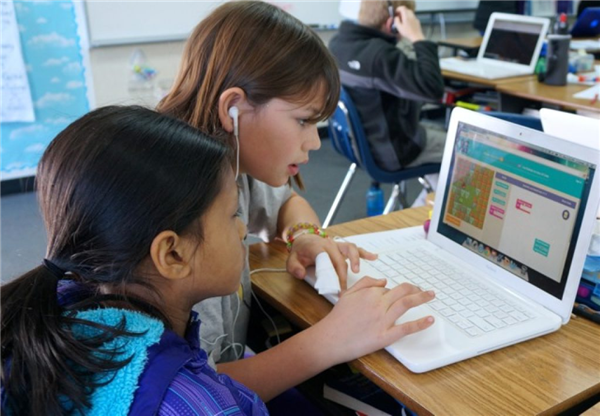 • Apple, Microsoft, Google, Amazon, the Boys and Girls Clubs, the College Board, Bill Gates, Mark Zuckerberg, and over 100 others, are uniting to back the Hour of Code campaign. The Computing in the Core Coalition and Code.org are organizing CSEdWeek 2013. The annual CSEdWeek celebrates the birthday of computing pioneer Admiral Grace Murray Hopper (December 9, 1906).